Some of the most brilliant writing I have ever encountered came in books I couldn't finish. These books had it all: stunning insight, diamond-sharp imagery, dynamic sentences that seemed to leap straight from the page. Each one of these masterpieces showcased writing of a caliber I couldn't even fathom. Writing so far above mine all I could do was bask enraptured in its enormous shadow. If only I could craft even a single sentence like these authors, then I'd feel okay naming myself a writer. But thought these books may be master studies in the craft of writing, for one damn reason or another I just couldn't finish them. Infinite Jest is a brick. A beautiful, brilliant brick but a brick nonetheless. It is a daunting 1,079 huge pages of microscopic font. But immediately upon dipping my pinky toe in the first chapter, I knew I was swimming in something special. The sentences are infuriatingly brilliant and the descriptions so vivid I could have tossed my computer into nearest lake with envy. I wanted to write like that. 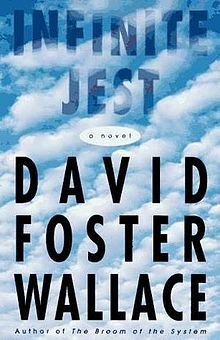 I wanted to be David Foster Wallace. When he committed suicide in 2009, I was shocked. I'd lost a hero, and modern American literature had lost an icon. Infinite Jest is described as "encyclopedic postmodernism" and has been compared to Thomas Pynchon's Gravity's Rainbow. 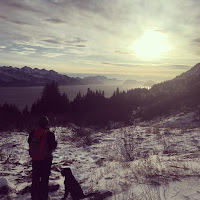 During each of my attempts to read it, I had the distinct sense I was experiencing something profound, something that struck so deeply at the core of our deeply troubled society that it laid bare all of our innumerable foibles, good and bad. In the end, however, I suppose I was simply too overwhelmed by the immense gravity of what I was experiencing to understand it. My enthusiasm withered like a dying well after just 300 pages. In subsequent years I tried three more times to pick it back up but to no avail. There were simply too many characters and too much dizzying description. About a third of the book is page after tedious page of endnotes, necessitating constant flipping back and forth. For me, this literary dystopian megabook simply collapsed under its own weight. 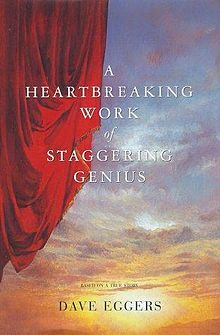 A Heartbreaking Work of Staggering Genius is a fictionalized memoir that earned a spot on The Times top books of the decade (2000-2010). It truly is heartbreaking and there is a staggering measure of genius. It was a New York Times Bestseller and a finalist for the Pulitzer Prize. I love Dave Eggers. His quirky antics and brilliant championing of literacy inspire me to become not just a writer but a steward of the written word. He founded McSweeney's, which quickly rose to become one of the most prominent literary journals in the world. You can watch his inspirational and hilarious TED talk about encouraging writing and literacy among children here and witness for yourself basically everything you need to know about his ebullient personality and unique brilliance. I challenge you to watch it and not be inspired to go find a random kid on the street and teach him how to read. Eggers' parents both died within months of each other when he was in his low 20's necessitating him to raise his eight-year-old brother like a son. This tragic set of circumstances forms the subject of Genius. 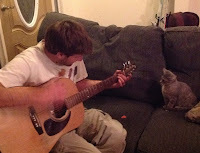 His story is deeply moving and his manner of telling it is something to behold. The book is also hilarious at times, and starts with a lengthy preface that provides (among other things) a list of irreverent tips to better enjoy and understand your reading of the book that follows. Much like Infinite Jest, however, I found all of the distractions and digressions, well, distracting, and eventually it was gathering dust on my coffee table with my bookmark stuffed somewhere in the middle. 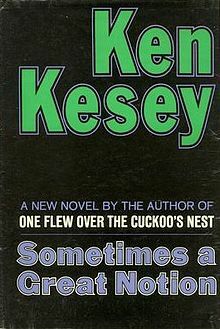 Published two years after more famous One Flew Over the Cuckoo's Nest, Sometimes a Great Notion is Ken Kesey's second novel and very different from his first. As with Jest and Genius, the writing is painfully brilliant yet unbelievably convoluted. The imagery cuts like sharp coral on virgin toes. The characters are intriguing and the plot is fascinating. However, the multiple overlapped voices (which often jump from a first person narrator to third person then on to a different first person with barely any clues to illuminate whose mind you are now in) makes the book almost unreadable. Though many consider this book one of the classic pieces of American literature in the second half of the 20th century, I found it daunting (my edition was well over 700 pages) and my motivation for it fell apart halfway. With each of these books, I felt like a better writer after reading even just a part of it. Every word is meticulously selected. Every sentence flows like perfect music. But somewhere along the way, something broke. Perhaps they were overly self-indulgent in their explosion of artistic expression. More likely the fault lies within me: I'm not patient or clever enough to recognize that the very things that turned me off about these books is what makes them so great. Sounds about right. Wonderful books to hate... Thanks for reading!